So I don't know if this topic has been made before, but I searched and didn't find anything. 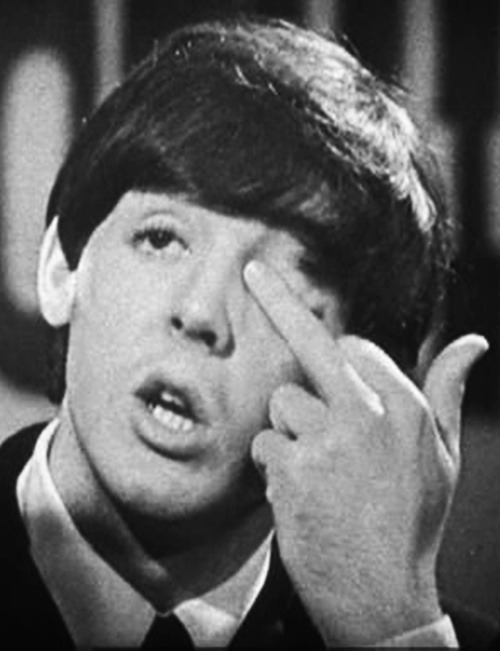 So I've noticed on many occasions, that Paul McCartney will wipe has face and point and stuff with his middle finger rather than his index finger with no real visible reason for flipping someone off. I guess it's just funny Paul quirk. 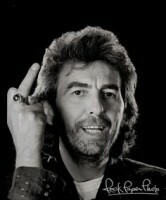 So I wanted to dedicate this thread to posting pictures of of times you remember Paul using his middle finger in place of his index. Here's one picture I'm sure a lot of you have seen. That having been said, upon closer inspection, it's not the worst thread idea ever. Though I put in the Mother Superior thread that maybe this should be in the Beatles Pics section instead since it's intended as a photo thread? Maybe? I thought about that, but it's very Paul centered. 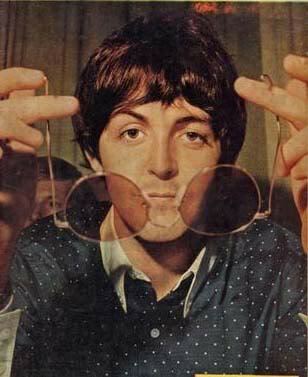 Also I made this thread because I just really noticed this the other day while watching Paul McCartney interviews. He used to do it a lot, yeah. Still does sometimes, apparently. Don't know if this counts, but..
Yeah, I wonder if it's intentional. No, definitely not. It may have been a few times, like when John threw a pillow at him during an interview on an aeroplane, but it really seems to be just a involuntary thing most of the time. He's usually pondering something when he does it, much like when he bites his nails or chews his lip. I think that's a funny quirk that Paul has. Ah, I love this forum! I've noticed him doing this in interviews even quite recently. It comes across to me like a self conscious habit. I'm sure I've read body language guides somewhere which say it's when someone feels self conscious when talking and they are trying to appear more natural. It looks very purposeful when he does it but perhaps he's not aware of it. My father in law does this as well. When I first met him, I thought it was his opinion of me. It turns out it is unintentional. 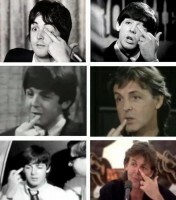 I was just watching Let It Be the other day, and there's this scene where Paul uses his middle finger to scratch his face and then he starts pointing at stuff with it just because he already has it out. It's obviously subconscious, but I laughed a little bit when I saw it. 'Put music to our troubles and we'll dance them away..."
At least he keeps it well-groomed. You can't go pointing fingers with long or dirty nails now, can you? LOL ! It's definitely a subconscious thing. It is funny though. 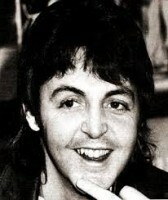 Aww... that's a cute picture of Paulie! LOL! It's not actually subconscious, he just hates everyone. Talking about that, shouldn't it be a smiley? I do it all the time too actually (although sometimes I'll notice and swap fingers quickly)-- I get it from my dad.